In college, my best friend, was a member of a Sant’Egidio community. She met for evening prayer every Monday and visited a nursing home in a poor part of town every Friday. The day I broke up with my boyfriend I was depressed and didn’t want to leave my house. I told her not to come over, that I just wanted to be alone. She came over anyway, and after doing my dishes and listening to me talk for a while said, “C’mon let’s go” and took me with her to visit the nursing home. Every part of me just wanted to stay home and watch movies, but doing something kind for someone else, and taking a break from feeling sorry for myself, actually made me feel a lot better. In any major city in the United States you can find a Sant’Egidio community. Their evening prayer services are renowned for their beautiful a capella singing and preaching. Even non-believers enjoy these services, and all are welcome, so it’s a good place for seekers. Today there are 50,000 official members in 70 countries and many more who participate in the work of the community in an unofficial capacity. Sant’ Egidio was started in Rome in 1968 by a group of high school students who found themselves living in a secular, post-Christian world. They rejected Communism and Fascism, and were troubled by the American bombings of civilians in Vietnam. They were inspired by the Scriptures and wondered what it would look like to live the Gospel in the world. They wanted to change the world, by changing people’s hearts. The founders of Sant’ Egidio were inspired by the example of St. Frances of Assisi, who made friends with the poor, dialogued with Muslims during the Crusades, and who, like Jesus, rejected the other-as-enemy-logic of the world. These teenagers were also responding to the isolation of modern life. They wanted to go out on the streets and meet their neighbors. They began by going to the poorest part of Rome and starting an after school program. There they shared what they had learned in their classes with young people who could not afford to go to school. From these humble beginnings the community has continued to grow and flourish. They’ve opened hospices for AIDS patients, held interfaith prayer services in the spirit of ecumenical dialogue, opened restaurants where mentally and physically disabled persons can work. They’ve fed the homeless and hungry, worked for the abolition of the death penalty and even ended wars. In 1992 Sant’ Egidio peace negotiators brokered a peace deal which brought an end to a 15 year civil war in Mozambique that had cost over a million lives and displaced over 500,000 people. One of the key tenets of Catholic Social Teaching is “solidarity,” the belief that individuals and nations have a special responsibility to provide for the poor and the outcast, the people Jesus calls “the least of these”. The Church teaches that, despite our ethnic, religious and ideological differences, we are all members of a single human family, and we are called to be our brothers and sisters keepers. Lay people live their Baptisms every day in a myriad of small and unseen acts. They give to the poor. They wipe children’s noses and bottoms. They work two jobs to feed their families. They bring Communion to the sick and homebound. The work can be difficult. It’s good to have friends and acquaintances that encourage and support you along the way. Anna Keating is a blogger, writer, small business owner, and mother of two. 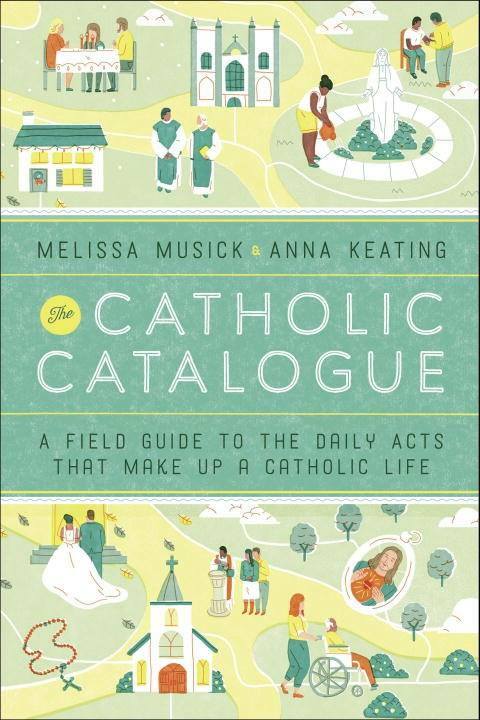 She’s the co-author (with Melissa Musick) of a new book: The Catholic Catalogue: A Field Guide To the Daily Acts That Make Up a Catholic Life (Penguin Random House), from which this article on the crucial role of lay groups and associations in the life of the Church is excerpted. You can check out her latest blog posts at thecatholiccatalogue.com. This entry was posted in Journal and tagged Sant’Egidio, Social Justice, The Catholic Catalogue. Bookmark the permalink.